The National Trust says it is fighting a constant battle to protect areas of Cornwall's coastal footpath from erosion. Rising sea levels caused by global warming and freak storms are causing damage. The increasing popularity of the route with walkers is also taking its toll. The Trust, which owns a large section of the coastline, says it is now directing more money and resources into protecting the paths through a shoreline management plan. At Kynance Cove, for example, careful management and erosion repairs have been carried out to enable the vegetation to regenerate. The Trust says it is being forced to fence off potentially dangerous areas to protect walkers and the environment. But Phil Dyke, manager for the Trust in Falmouth and mid-Cornwall, said people using the footpath had to be responsible for their own safety. "We can put a barrier up, but a little child could climb up and topple over the barrier so it is not necessarily a solution. "The biggest thing is personal responsibility - people being sensible when they are out on the coast. "They should dress appropriately, wear the right footwear and take care with children and animals." South West Coast Path Association secretary Eric Wallis said it was often a major problem reinstating cliff paths that had fallen away. 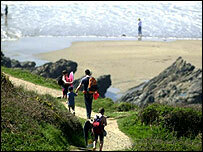 "If a coast path falls away, there is not an automatic right to reinstate it or move it back. "Negotiations have to go on between the managers and the landowner to re-route the path."